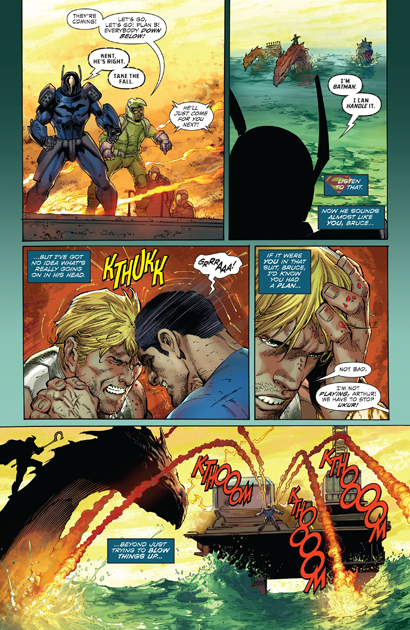 Comics Wednesday "Truth Hurts" by Grek Pak, Ardian Syaf, Yildiray Cinar, and Howard Porter. Superman takes a few punches, but still stands. He then takes off, leaping onto the refinery. The big McGuffin powering it is called The Sun, and Superman fights Ukur off it, and along with Batman rides it into the sky, hopefully where it will explode away from people. 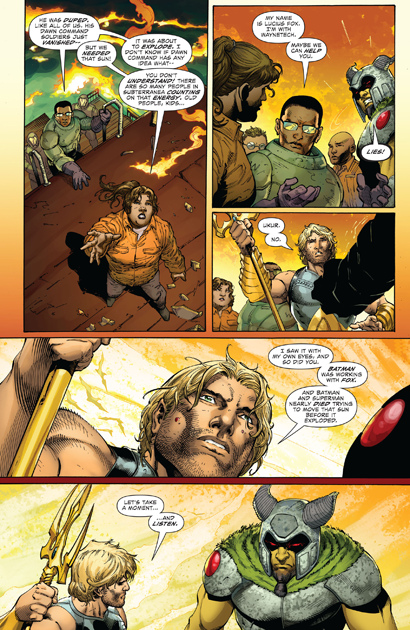 As Aquaman and Ukur shake hands, Batman and Superman squabble, ending with the Dark Knight Detective warning Superman to "Stay out of Gotham." Some things never change. Not having read this series before, I had not a clue what was going on, nor am I up to date with Superman and Batman's new look(s). 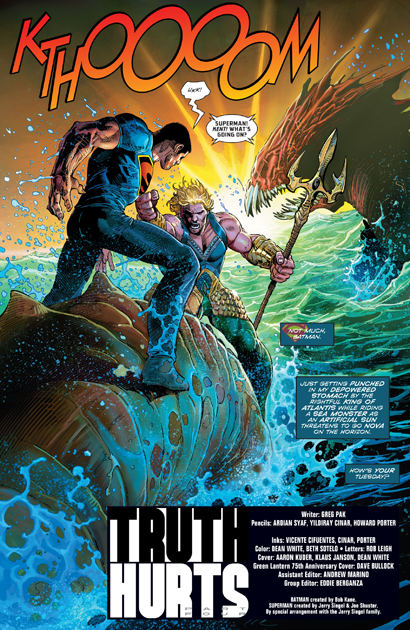 So I did my best to follow along, enjoying the site of Aquaman head butting the Man of Steel and surviving. He's still a giant hothead, so when he lectures Ukur about listening, I feel like the next panel really should have been Ukur giving his king a Liz Lemon-size eye roll. 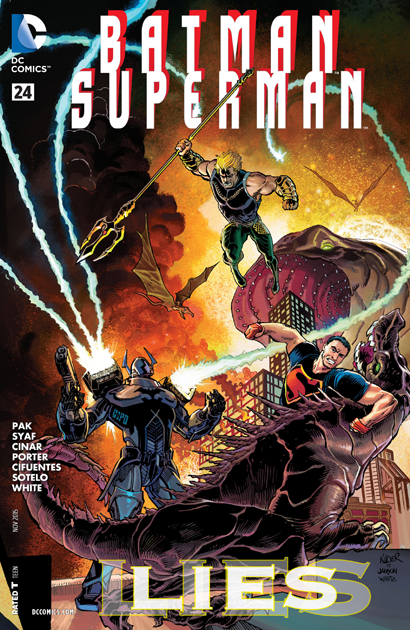 Okay, grumpy old man time: Superman, Batman, and Aquaman in a comic, and if it wasn't for the word balloons, no one could identify any of them. Top drawer, DC. Top drawer. 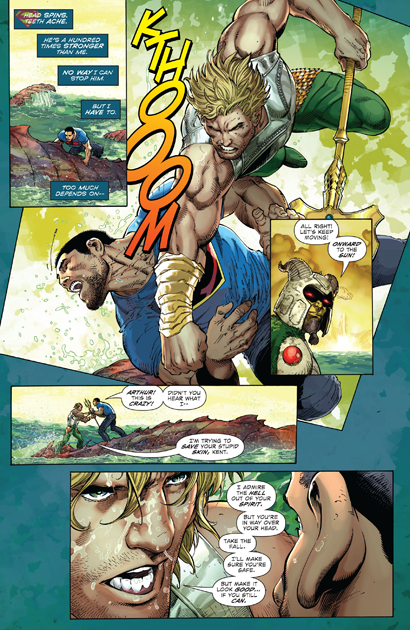 Superman didn't take off to the refinery, Aquaman punched him so hard he landed there. Do people even play attention to the art these days?